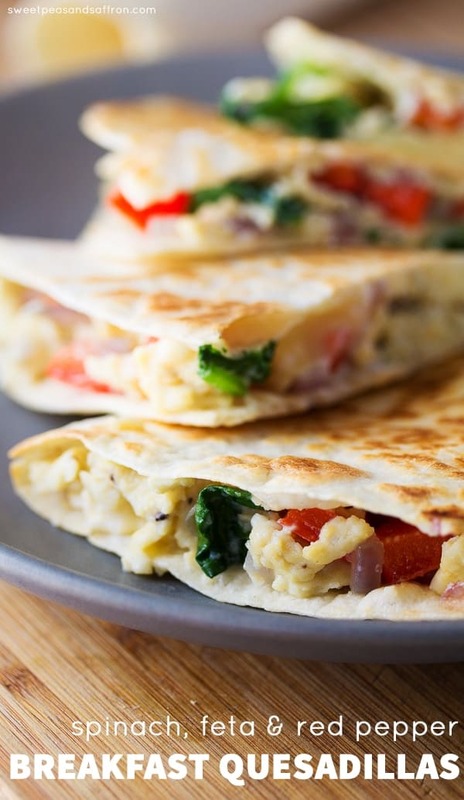 Make-ahead breakfast quesadillas filled with scrambled eggs, feta cheese, spinach and red peppers. An easy, healthy week-day breakfast! Even though my kiddo isn’t school age, seeing anything that has anything to do with back-to-school makes my heart sink. The only thing about back to school that I ever looked forward to was the fun new school supplies…fresh paper, new pens, new binders and pencil cases… To this day, going to the stationary section kind of makes my heart race in a weird nerdy way, especially those post-its…I just can never have too many post-its. And highlighters! Ahhh! Well. I suppose back to school is eventually going to be here. 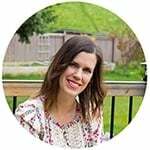 And I know how hard it is to get myself and Kai out the door in the morning, I can’t even imagine how challenging it will eventually be to get multiple kids dressed, fed, and out the door. Props to all you parents who do so! And here are these egg breakfast quesadillas that can be made ahead and frozen for an easy breakfast…perfect for school (or work) mornings! Ok if I’m being 100% truthful here, I am the worst at breakfasts. Kai gets a nice nutritious breakfast with fresh fruit, yogurt, cheerios, and a bit of honey (the kid is obsessed with honey 😉 ). But Denise: PB toast and coffee. Without fail. Every single morning. I have no excuse other than I am just not a morning person. I am so lazy it’s kind of embarrassing! In addition to me being a total lazy bum in the morning, poor Ben has to get up for work at 5am. And he certainly doesn’t have time to make himself much more than cereal, so I set out (for both of our benefits) to find some make-ahead breakfast ideas. And here is number one! Breakfast quesadillas, filled with scrambled eggs, red pepper, feta cheese and spinach. These guys are deeelish. And they can be made ahead, stored in the fridge for 3-4 days, or frozen and thawed as needed. Storage & Preparation: I stored these wrapped in plastic wrap in the fridge or freezer in a sealable container. Reheating the refrigerated quesadillas was a breeze: I recommend using the frying pan, if possible, but we had the crispiest and quickest reheats on our George Foreman grill. For freezer-stored quesadillas, defrost in the fridge, or in the microwave (on a paper towel) for 30-60 seconds, then if possible, on the frying pan/grill. They won’t be quite as crispy as the freshly made or refrigerated quesadillas, but they are still super tasty! So. Hope you guys want some easy, make-ahead breakfast recipes. Because I’m getting awfully tired of PB toast! A make ahead breakfast quesadilla filled with scrambled eggs, spinach, feta cheese and red peppers. In a large non-stick pan, heat the olive oil over medium heat. Cook the bell pepper and red onion until soft, around 4-5 minutes. While cooking, whisk together the eggs, milk, salt and pepper. Add the egg/milk mixture to the peppers/onions, stirring frequently, until eggs are nearly cooked through. Add the spinach and feta and fold into the eggs, stirring until spinach is wilted and eggs are cooked through. Spray a separate large non-stick pan with spray oil, and heat over medium. Add the tortilla, then one half of the tortilla, spread about ½ cup of the egg mixture. Top with around ⅓ cup of shredded mozzarella cheese. Fold the second half of the tortilla over, then cook for 2 minutes, or until golden brown. Flip and cook for another minute or so (until golden brown). To store for refrigerator or freezer: cool completely on a wire rack, then wrap in plastic wrap and store in a resealable container. To reheat from refrigerator: fry up on medium in a frying pan, or heat on grill for 2-3 minutes. To reheat from freezer: heat in the microwave on top of a paper towel for 30-60 seconds, then crisp up in the frying pan or grill for 2-3 minutes. Any suggestions for subsituting egg whites? Not a fan of spinach but definitely a fan of pepper and Eggs! I don’t mind compromising. I hope my cooking ends up like the images you took! But probably not I guess! How are thawed scrambled eggs? ?? I’m not sure as I’ve never frozen straight up scrambled eggs, but these breakfast quesadillas are very good after thawing! Thanks, Arpita! They’d make a great lunch and dinner for sure! I feel the same way about back to school. My oldest starts school for the first time this year and as much as I am excited for him, I can’t help but feel a bit scared and sad at the same time. Easy make-ahead breakfasts like this are just what I need! They look fantastic! Denise, back to school is going to be there for you too in a few years!! 🙂 but yeah, enjoy the relaxes schedule now while you can! I always loved getting new school supplies too! I think i just liked that everything was new. 🙂 I’m prepping for back to school lunches now so these make ahead breakfast quesadillas are great!!! they look delicious! NOOO. Ha ha, I guess Kai has to grow up 🙁 He has to go to daycare in the morning and it’s still a gong show even though we don’t have to be there until a bit later than school. Thanks, Alice! How on earth did I miss that, Sarah?! We must totally be on the same (super awesome) blogger wavelength. Heading over to check yours out! I still love looking at school supplies and yes to post-its! I have more than I will ever use but I just keep stocking up! These quesadillas look just perfect for busy weekday mornings! Love the spinach and feta combo! I actually spent $12 on post-its the other day…and now my office is COVERED with them 😉 Thanks, Gayle! I am so not a morning person either! Making things ahead is right up my alley 🙂 And it is definitely hard to get a good serving of veggies in at breakfast – I love the all the colors you have going on in these quesadillas. I’m glad I’m not the only ‘non-morning person’ out there 😉 Thanks, Sherri! I get into a breakfast rut, too – eat the same thing every morning because I’m too lazy to try and do anything else. So I’m loving these – anything I can do ahead of time and then just pop in a pan to heat up sounds ideal. Looking forward to trying this, Denise!